Hassan Khan’s “most comprehensive exhibition to date” was particularly challenging for viewers as many of the works require an engagement beyond the space of the institution. Khan’s works, ranging in form from texts to music performances to installations to esoteric objects unravel over time—if ever. The crux of the exhibition, for me, was 17 and in AUC (2003)—”performative action over the span of 14 days the artist sits for four hours every night in a soundproofed one-way mirrored architectural construction with speakers embedded in glass drinking beer, smoking cigarettes and speaking about his undergraduate years at the American University in Cairo” (as described by Mayssa Fatouh here). The artist’s rambling, scheduled and literally contained, addresses a formative period in his life; the act is perhaps nostalgic, but stronger is the feeling that there is an endurance test, an interrogation of self-mythicisation. The artist is consumed by the spectators and the self-entrapment reads as a desire to produce a space of production, of thinking—a work that resonates with the self-delineation of the other pieces in the exhibition. The below review on Hassan Khan at SALT Beyoğlu (September 21, 2012-January 6, 2013) was published in Modern Painters, January issue, 2013. In an artist’s talk entitled I am not what I am, Khan discusses a selection of his works, improvising and reading from a script while standing before a screen with images and a timer for 60 minutes. Despite its intensity and authoritative tone, this presentation sidesteps the audience’s expectations by offering no explanation of the artist’s work. Titled “Hassan Khan,” the artist’s most comprehensive exhibition to date poses a similar question: Does a retrospective show resolve a body of work, or does it have the ability to complicate it? DOM-TAK-TAK-DOM-TAK (2005), from Hassan Khan exhibition, SALT Beyoğlu, 2012. Photo: Serkan Taycan. Lungfan, 1995, a collaborative work with Amr Hosny, is an obscure collage of image and sound that marks the beginning of an artistic interrogation about how objects and cultural forms are known and how they are assigned value. In DOM-TAK-TAK-DOM-TAK, 2005, Khan mixes individual recordings of six musicians—who were not able to listen to each other while recording—interpreting shaabi tracks he selected (shaabi means“of the people” in Arabic). 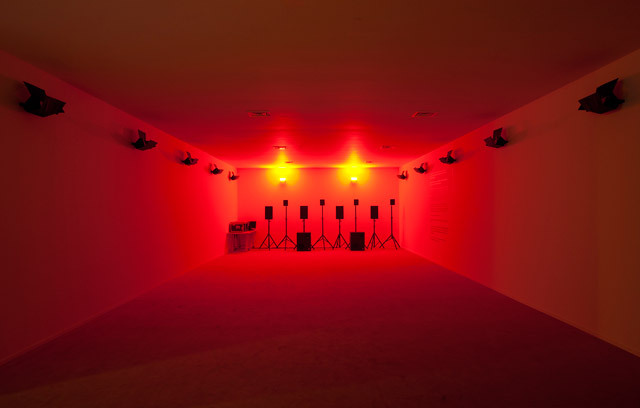 The automated structure of the sound and the mechanical quality of the installation stand in stark opposition to this musical genre, which is versed in the Egyptian vernacular. 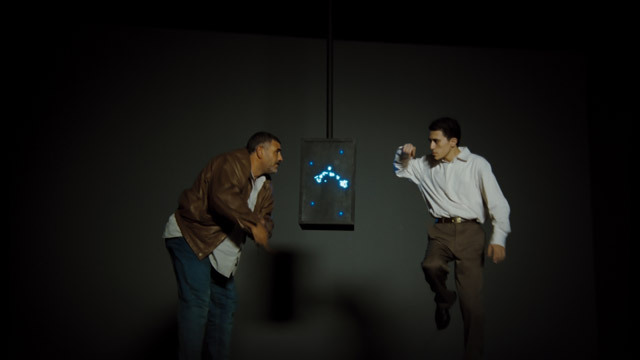 Similarly, Jewel, 2010, explores the performative qualities of automation in a video that records two men following a carefully designed choreography of popular dance moves, accompanied by a sound track made by the artist. Both works introduce the gap between individuation and submission to passed-on knowledge where cultural patterns are negotiated. Hassan Khan, Jewel, 2010. 35mm film transferred to full HD video and original music composed by the artist, 6′ 30″. Courtesy of Hassan Khan and Galerie Chantal Crousel. This artistic method is further investigated in the works that mimic or replicate found objects. Evidence of Evidence II, 2010, is a blown-up photographic reproduction of a worn-out, small-scale flower painting that hovers in space, superimposed on a background that gives the feeling of suspension. The work questions how the generic understanding of art is agreed upon as the artist turns the object into a dislocated snapshot. This gesture of repetition and suspense is also apparent in Banque Bannister, 2010, an exact replica of the banister in the Central Bank of Egypt in Cairo. The gold-colored sculpture floats in the air and is alienated from its function. 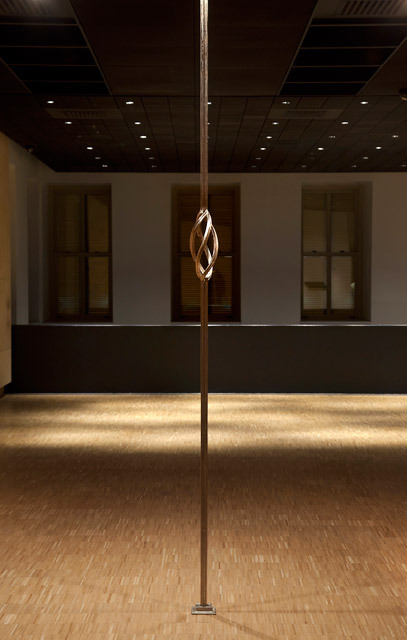 Similarly, The Twist, 2012, is an iron sculpture based on a balcony railing set vertically in the gallery with a nonfunctional twist in the middle. The Twist (2012), from Hassan Khan exhibition, SALT Beyoğlu, 2012. Photo: Serkan Taycan. Evidence of Evidence I, 2010, is the work that most closely relates to the premise of a retrospective. It comprises 23 hand-printed etchings of Khan’s own pieces, hung on a horizontal line at eye level. Here the artist not only documents his previous works but also reduces them to illustrations of his practice. While these can be read as a satire of the urge to self-mythologize or to standardize an artist’s oeuvre, in this solo show Khan does the exact opposite. This exhibition demonstrates that Khan does not follow recognizable patterns or an individualized visual language in his works. It does not propose a resolved reading of his practice, nor does it present a cathartic moment in his oeuvre; rather, it complicates the question of where the artist’s subjectivity as a tool of expression can be found in artistic production. Posted in content, on artists and tagged 17 and in AUC, Özge Ersoy, DOM-TAK-TAK-DOM-TAK, Evidence of Evidence I, Evidence of Evidence II, Hassan Khan, I am not what I am, Jewel, SALT Beyoğlu, The Twist. Bookmark the permalink.